We left Hot Springs on Friday, wishing that we had another day or two to spend there. But, Memphis calls – with the promise of BBQ and Mud Island Park – a place John’s been talking about visiting ever since we began this trip. 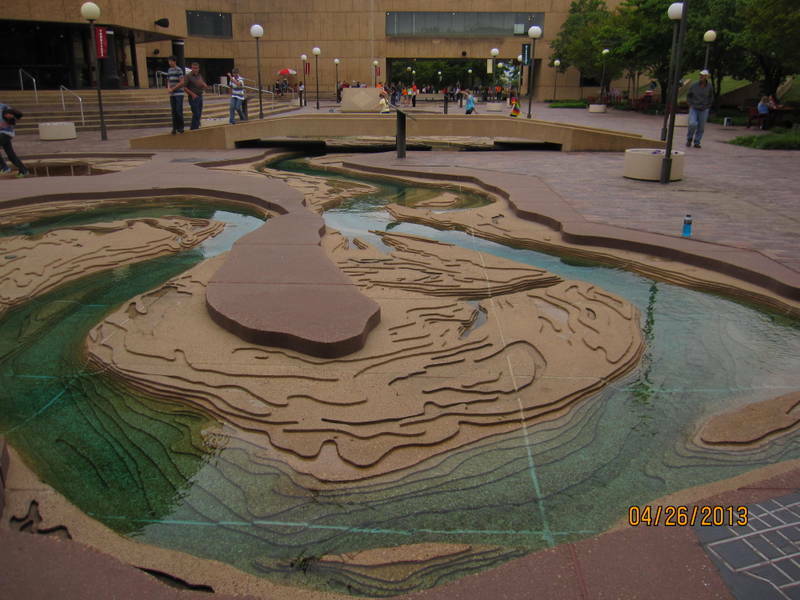 Mud Island Park contains a scale model of the Mississippi River, from the northern basins down to the Gulf of Mexico. Informational panels tell the story of significant bends and Corps of Engineering changes that have been made in the River’s flow. You can walk in the water and step across the River. The model is produced by the Corps of Engineers. Picking up all that new knowledge made us hungry, so we headed to Neely’s Interstate BBQ, a restaurant that’s been on John’s BBQ radar for years. 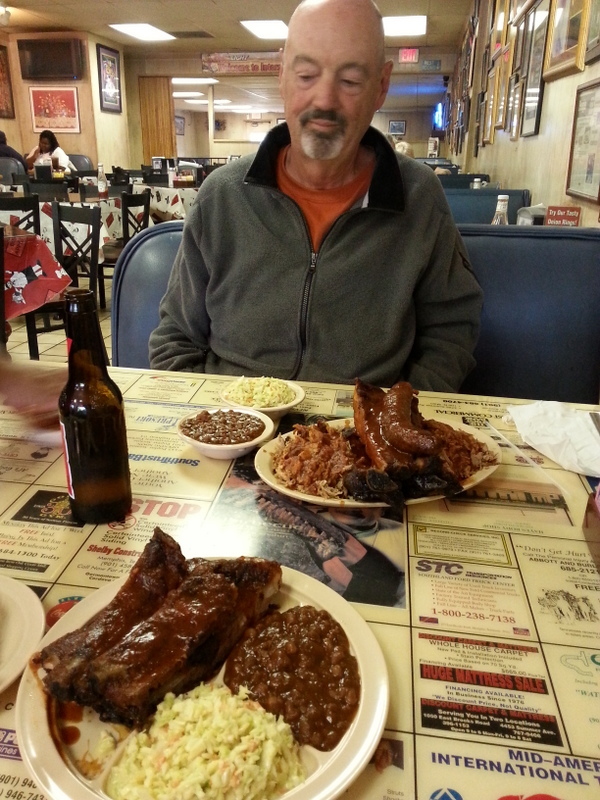 We ate eye-popping amounts of BBQ (John, especially). Our favorite item, curiously, was the hot link sausage. We liked everything else, especially the pork ribs. We did wish that the sauce would have had a bit more kick to it – guess we’re addicted to spicy foods. 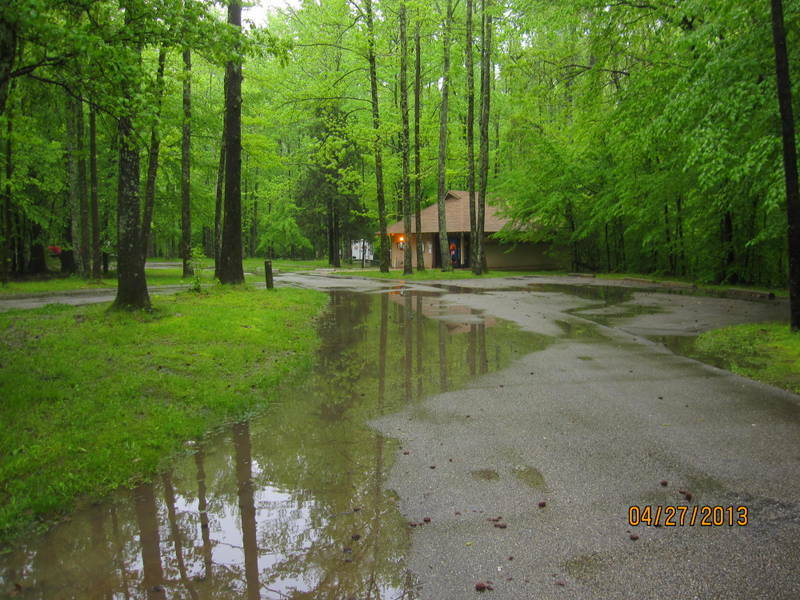 We headed to Meeman-Shelby Forest State Park, right on the Mississippi River, about 25 miles north of Memphis. Parked the Fireball, leashed Jezzy up and decided to stretch our legs with a hike. We wanted to get down to the shore of the River. Folly! After walking forever (it seemed), and crossing the same little creek about four times, we turned back. Good timing, as it was starting to thunder again and rain in earnest. Holy cow – what a storm! By morning, we thought we might have to swim our way out of the Park. 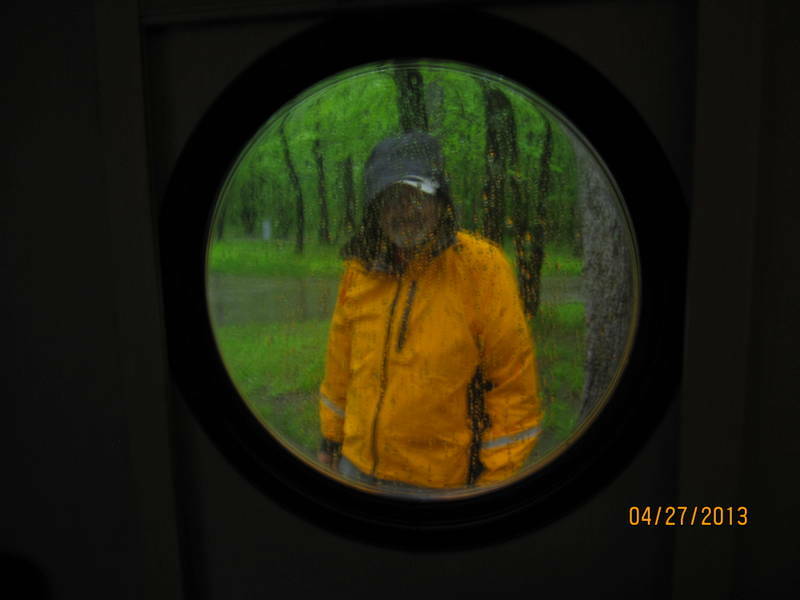 Scary view thru the porthole at Meeman Shelby Forest SP. We did get packed up & moving without too much incident, and headed to Evansville. Fluffy towels and a real bed await us at John’s brother’s house. We’re excited.